The Breton town of Plumelec will live up to it’s motto – Land of Cycling – today as it forms the finish line for the Stage 9 team time trial. There are two intermediate time checks along the course, the first at Km 10 (Lesnevé), and the second at Km 20.5 (Le Croiseau). 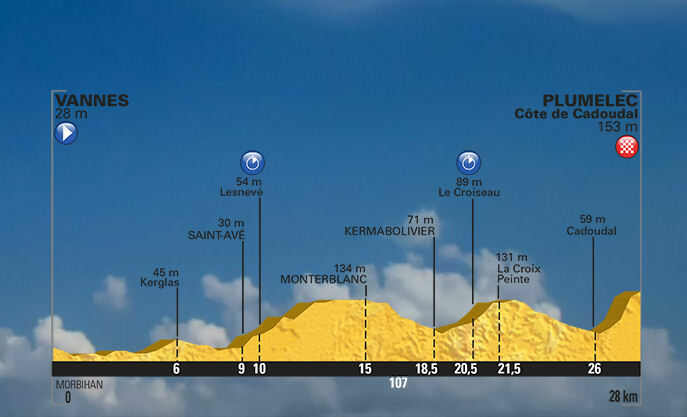 The Côte de Cadoudal is the finishing climb, beginning at about Km 26.5. It’s a 1.7-km climb with 6.2% average gradient. Click on the map and profiles below to enlarge, then scroll down and click to supersize.